Travian kingdom is an improved version of Travian legends. Like all the strategy video games, building and resource management has always been the core of all strategy games. In this MMO game, players will have a choice of taking up different heroes which will affect their role in the village expansion efforts. Instead of juggling between economics and military expansions, players will mainly focus on one. This adds an interesting twist to the typical strategy gameplay. Like most MMO strategy games, your main objective is to expand your village and make it prosper. With successful conquest of the neighbouring villages, your village will expand, watch your village develop into a kingdom right before your eyes. Building important structures are especially important in this resource management game. There are also side quests that can be completed for extra income and experience points. Depending on the choice of your role of being a king or governor, you will have a different objective in this browser game. As a governor, your primary objective is to support the king. Governors will focus alot more on the economy and the resources of the village. The kings, on the other hand, will focus more on strengthening the army. They will be more conquering and battles involved. Both characters will forge alliances to develop the village better. Each player begins with an underdeveloped village. This village will be eventually be developed into your capital. Players can conquer other villages for expansion. This will increase total resource production and support larger armies. In the early game, you have to decide on a tribe. There are 3 tribes that you can choose from. Romans – Roman troops are typically the most powerful troops in this game. Yet, they take a longer time to train and they cost much more as compared to the troops from the other tribes. They are widely used by fellow players who are more experienced. Teutons – The Teutons are powerful and they can be produced in large number with a short amount of time. They are ideal for players who are more aggressive. Gauls – They have the highest defence stats and are tough. Their resilience in attacks makes them perfect for beginners. As mentioned, there are two characters to choose from at the start of the game - the king or governor. As a governor, your primary objective is to support the king while the king focuses on military expansions. As unpredictable as the game gets, governors can also turn their back against their kings by joining other kingdoms. When a king has not logged in for three days or if his population is knocked down to zero, they will automatically be renounced. One of the main crucial change in Travian kingdom is the graphics. You will notice that the map appears to be richer in colour, adding more liveliness to the browser game. The borders around the areas of affected kingdoms are also cleverly displayed. It is clearer now with different contrasting colour highlights. As for the sound, there are additional sound effects added when interacting with buildings or other game elements. This makes the game surreal. Below are the top 5 tricks for our early game in Travian Kingdoms. - Create a second village as early in the game as you can. This will allow you to have an ideal location with optimal resource field. - Focus on completing your tasks. The rewards for each task is relatively significant in the early game. This will allow you to have your second village at a tremendous pace. - Forge alliances. Travian games is a community game that requires alot of communication. For a simple removal of the robbers' hideout can easily need the help of 4 other fellow players. I can’t stress the importance of having an ally. - Raid Oases as much as you can with your hero. Oases contain up to 25% bonus and it holds 1000 of each resource. The benefit of claiming the available resources in the Oases outweighs the risk involved. - Using a hero cage to capture a natural unit. Natural units like elephants and crocodile can be easily captured and support you in your battles. In conclusion, Travian Kingdoms is a great improvement of the later, Travian legends. Comparing to other video games, one can easily understand why there are over a million players that are engrossed in this game. The constant teamwork, communication and alliances with fellow players involved, make this Travian game dynamically interesting. In terms of graphics, it has great graphics with added depth. The colour contrast makes it easy to spot borders of affected areas. 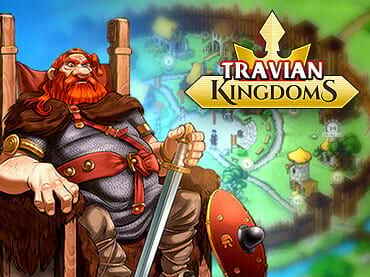 Travian Kingdoms is available for free in GameTop. Try out this free download here. If you have questions about Travian Kingdoms game, please contact us using this form.